The monument consists of a granite plinth on a single base. The plinth is topped with a low pyramid shaped top with a chalice standing at the peak. The plinth and base have rounded edges. Inscriptions appear on the south and north face. Rear Admiral McDougald, commandant of naval operations at Norfolk Navy Base, gave the principal address during which he traced Hewes’ part in the struggle for independence. Hewes was one of the most celebrated members of the Continental Congress. As secretary of the Naval Board it was Hewes who secured John Paul Jones first commission in the Continental Navy. On May 27, 1776 by presenting the Halifax Resolves to the Continental Congress he may have been the first to appear before that body to directly call for independence. On July 4, 1776 he was one of three North Carolinians to sing the Declaration of Independence. 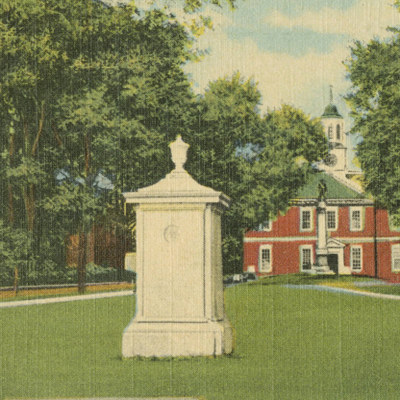 The Hewes Monument is the only monument to a signer of the Declaration of Independence erected by congressional appropriation thanks to the efforts of Representative Lindsay Warren. A plaque commemorating Signers of the Declaration of Independence is located in the rotunda of the North Carolina State Capitol in Raleigh, NC. In 1897, a monument to William Hooper and John Penn was unveiled in Guilford Courthouse National Military Park. The monument is located on the south end of the courthouse green of the old Chowan County Courthouse. It faces E. Water Street on the water front near the battery of Revolutionary War cannons. A short distance to the north on Colonial Avenue is the Edenton Tea Pot. The Chowan County Confederate Soldiers Monument originally stood right behind the Joseph Hewes memorial in front of the historic Chowan County Courthouse on King Street. It was moved to its present location on South Broad Street in June 1961. Edenton Bell Battery C.S.A. cannons are facing the waterfront at 505 South Broad Street on the side lawn of the Penelope Baker House Welcome Center. The memorial faces the waterfront and is surrounded by shady trees and greenery.